Bruce Ing tells me that the slime mould on our lawn is Physarum cinereum. This is a new record for v.c. 104 and apparently the first slime mould recorded from Raasay. 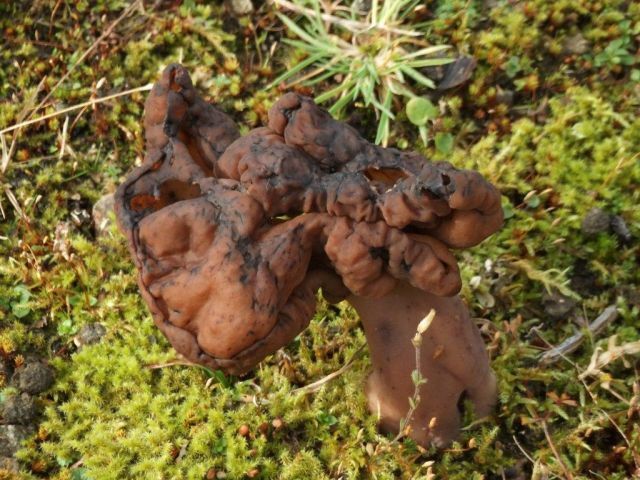 Carole Millington sent me some images of a fungus that Dave Genney has identified as a false morel, “most likely Gyromitra esculenta, a spring species, but possibly G. infula which is more of an autumn species”. Since they were spotted near Dunvegan Castle in October, perhaps the latter is more likely. Philip Sansum sent me an excellent set of nearly 400 Skye records from early October and Robin Walls sent me over 800 records from time spent on Skye around the Field Meeting in July. Tantalisingly, he recorded Arum maculatum (Lords-and-Ladies) but has since had possible second thoughts – I know the feeling well! This would be the first record localised to better than a 10km square and the first record since 1950. An early target for 2012. Sarah McGrory sent records from Rum including many for Arabidopsis petraea (Northern Rock-cress). A report for the second half of 2011 has been put on my home page.